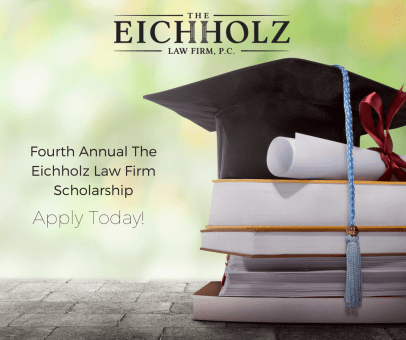 The Eichholz Law Firm is excited to announce the fourth Annual Eichholz Law Firm Scholarship for Higher Education. The goal of the scholarship program is to help high school students attend college. The scholarship is awarded each year to one senior high school students in surrounding high school districts. The scholarship is open to students passionate about achieving a continued education in Georgia. The education endeavor underscores the importance of education to attorneys at The Eichholz Law Firm and the importance of supporting the community through multiple initiatives. The high school honoree will receive $1,500. •	Must be enrolling or accepted in an accredited community college or university in Georgia. •	Applicant must have a minimum GPA of 2.5 unweighted. •	Submit an original essay of at least 500 words on one of the provided topics. •	Application forms must be filled out completely. •	Must be a student in Chatham, Effingham, Bryan or Liberty County. Please apply to the scholarship by clicking here.